Founded in 1932, Newly Weds Foods is one of the world’s leading ingredient manufacturers for the food processing and foodservice industries. The Chicago-based company develops and manufactures seasonings, marinades, batters, breadings and countless other products for some of the biggest restaurants and food distributors in the world. Recently, their Cleveland, TN plant found itself in an all-too-common position: their IT team was struggling to maintain their aging computer systems and were tired of the frequently repeating cycle of replacing failing hardware. 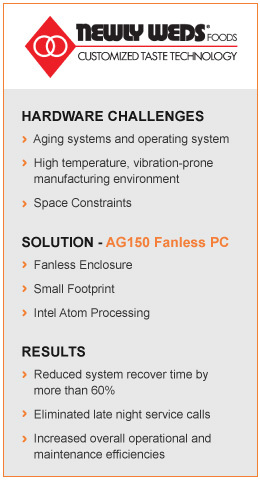 They went looking for a better alternative to the tower PCs they’d been using for years, with an eye toward a fanless solution that would both reduce downtime on their manufacturing line, and increase overall system longevity. As a major food manufacturer, Newly Weds Foods needed small form factor systems that could stand up to their extended production schedule and resist damage from the heat and airborne particulate created by their various production processes. In our new client profile see how Logic Supply was able to help the Newly Weds Foods IT team cut line downtime by two thirds, eliminate late night service calls and get a good night’s rest for a change.